To improve the diagnosis and treatment of diseases, scientific discoveries have to be “translated” into practical and clinical applications. Such discoveries are typically made during basic laboratory research (“at the bench”) where scientists search for new discoveries at the molecular or cellular level. This knowledge then has to be transferred to an application at the clinical level (“the patient's bedside”). However, at least as important is the exchange in the opposite direction: from the bedside important needs and observations are communicated back to the bench to direct basic research and innovation towards the tools needed in the clinic. 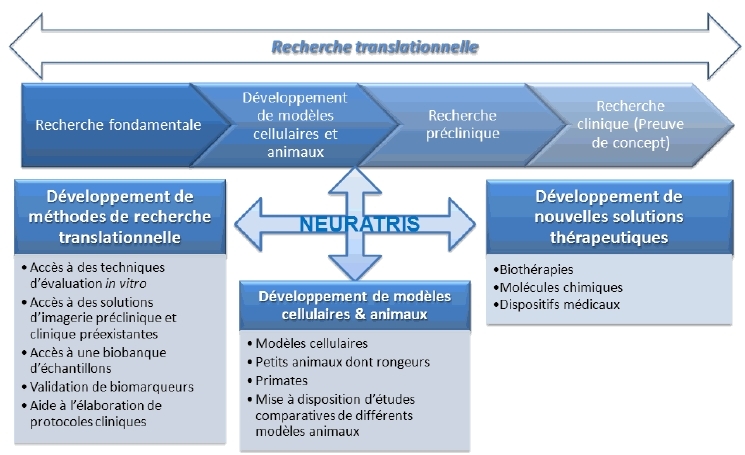 Translational Research (TR) is therefore a two-way-approach – “bench to bedside” as well as “bedside to bench” and is also crucial for the implementation of new methods of prevention, diagnosis and treatment to alleviate the social and economic burden of major neurological pathologies. There are however major bottlenecks in converting upstream research into healthcare applications, with a lengthy and costly process of development and a very high attrition rate due to a lack of models and targets revalidation, predictability of efficiency of therapeutic agents in human, and a lack of non- invasive and reproducible tools for target evaluation along the preclinical and clinical steps. In order to discover novel solutions in diagnostics and therapeutics, scientific and technological breakthroughs are keys. Due to the multidisciplinary nature of translational research programs dedicated to brain disorders and the need to integrate sequential steps in the course of a complex process, it is crucial to promote platforms for innovation - built on the best level of excellence in the development of new therapeutic strategies - that are indeed open to academic, clinicians and industry partners and are capable of promoting/discovering new therapeutic strategies. NeurATRIS aims at creating such specific Research Infrastructure.